Designed and created by 2 mums in Australia, who wanted to combine tanning and skin nourishing ingredients to boost their skin confidence and make them feel fantastic about themselves! Which I think is great! Made by real people for real people (like me!) As a mum, I still want to look good and if I can use a product that also makes me look skinnier, then bring it on! 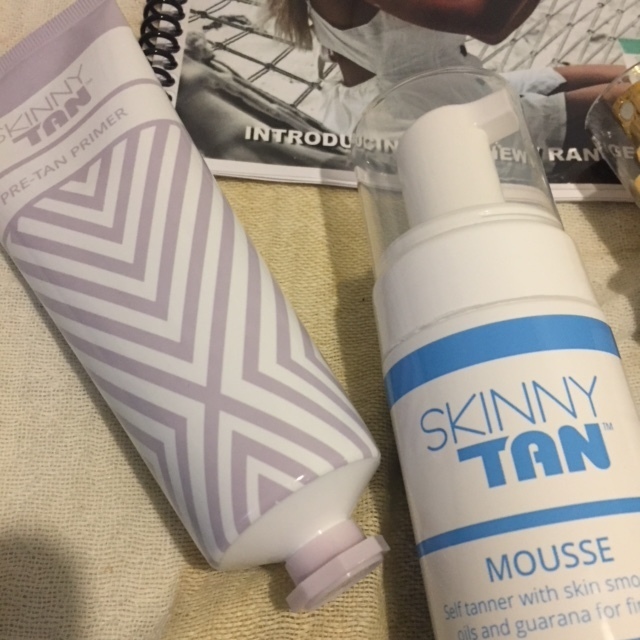 So, what is so special about SkinnyTan? It’s vegan friendly! Cruelty free! And utilizes 99% naturally derived ingredients it deliver a flawless, streak free natural coloured coconut smelling tan! So, I thought I would give it a go and test it out on my lily-white legs! Now, in case you are not in the southern hemisphere, it has been mighty cold down in Cape Town and my legs are beyond white and dry! To kick-start the process, I prepped my skin with the SKINNYTAN PRE-TAN PRIMER (R179.95). This helps remove any dry or dead skin cells, as it contains crushed walnut shell. (think of it as an exfoliator for your skin). You should use this with water in a bath or shower and preferably apply a few hours before you apply a self tan. After this, I applied the SKINNYTAN MOUSSE (R399.95). This is available in Natural or Dark. To apply this, I used the SKINNYTAN MIT (you wan to have one of these otherwise your hands end up all streaky and weird looking). I shook the bottle of Mousse well and then applied a good dollop onto the mit and then rub it on my one leg. When applying, be careful not to linger too long on the ankles, knees or elbows as they tend to come our darker. The mousse glides on really easily and evenly and I instantly had a lovely colour appear. You can layer this if you require a darker look. The Mousse combines not one but two green based certified natural tanning agents plus organic coconut for a delicious scent, organic Aloe Vera to help moisturize and of course the most popular cellulite active caffeine from naturally source Guarana Berries. (Bring it on!! – I need all the help I can get!) And this is suitable for Face and Body (you don’t find that very often). 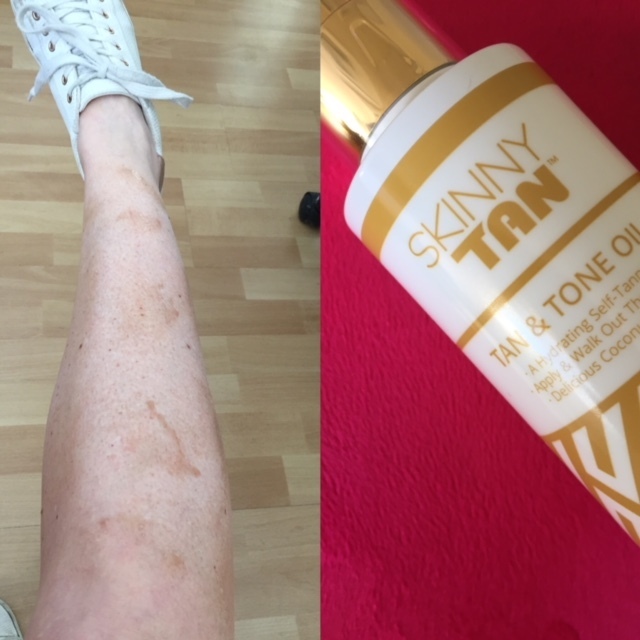 I was lucky enough to also have the SKINNYTAN TAN & TONE OIL (R399.95) to test, so I applied this to my right leg. This oil is natural, hydrating, quick and easy and looks so natural once one. No orange, no streaking and no skin drying chemicals. This really did help my dry skin and left me with a silky finish and instant bronze glow. The best is the smell. Often self tanners smell or don’t smell at all but this one smells great! A mixture of coconut and vanilla – which has had me dreaming about the beach all afternoon! Now to the get the rest of my body done! The range also consist of a 7 Day Daily Tanner (R299.95); a Gradual Tanner (R249.95); an After Glow Gloss (R199.95) and an Instant Tanner (R179.95). If you would like to know more about his brand, or where it is stocked simply click here!